We celebrated our 34th wedding anniversary on Friday. 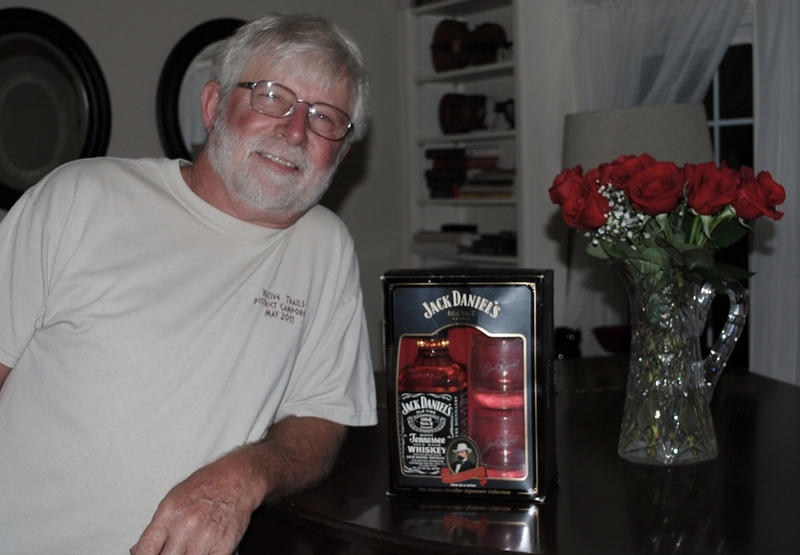 Well, celebrated is a bit of a stretch: Casey brought me a beautiful bouquet of roses and I brought him a bottle of Jack Daniels. We sat out on the porch swing, sipping the Jack and walking down Memory Lane. Our wedding, though, was hardly our high point. Our marriage, 34 years of hanging in and hanging on, 34 years of laughing and loving, 34 years of growing and morphing into the couple that we are…that was the topic of conversation. It’s a wonderful thing, this long-term commitment that is occasionally grim determination, and I marvel that we have come this far. Our personalities have little in common—he thinks math, I think words. In the early years, especially, I longed for him to “understand me” (though I certainly didn’t understand him). I’m a little emotional (ya think? ), with some mental health issues that occasionally over-ride my good sense; he’s very logical and always clear-thinking. Over time, those opposites blended, so that we are all that we need; our mutual introversion and love of home has bonded the relationship into the solid rock you see today. Of course, that’s what you see, and there’s always another side to marriage. We expect so much of each other and sometimes the results just aren’t what we had hoped for. We get angry and hurt and we argue the same arguments over and over. Somehow, we have managed to pull it all back together when that happens and the result is a stronger love, robust friendship, and great hope for another 34 years…or so. What a wordsmith you are, Jo Casey. That description is so true of many couples. Hope you have 34 more happy years. Sounds like a good beginning for a celebration. Happy anniversary.